Ica stones may have given scientists something new to ponder as they search remnants of the past in an effort to make sense of the evolution of our planet. Though there is some skepticism concerning the validity of Ica stones, their very existence leaves us something to ponder. Ica stones get their name from the location they were found, in Ica, Peru. These stones are found with various carvings that indicate what life may have been like centuries ago. Scientists often rely on images to learn about history, especially when there are no written accounts to lend insight to previous ages. These images serve the purpose of communicating when the written word is unavailable. In the case of the Ica stones in particular, the carvings depict things like humans riding on dinosaurs and other prehistoric images. These carvings are often very detailed and represent animals that are no longer in existence. The varnish on the stones indicates that the stones were etched before modern materials were available to reconstruct dinosaurs and other prehistoric images. This indicates that those who carved the stones may have actually existed at the same time as the prehistoric animals that are etched into the stones. Ica stones are made of a rock called andesite, made from volcanic materials. Since andesite is a rock and not made up of fossil material, it’s not possible to date the rock itself. Rock is not made up of organic materials, so carbon dating is not an option to ascertain the age of the rock. Andesite develops a bluish black varnish over time. This is the result of organic materials, like bacteria adhering to the rock. The etchings on the andesite rock that make the Ica stones so famous have a different color than the rest of the rock. However, these etchings also have the varnish that the rest of the rock has. The varnish in the etchings is not as old as the varnish on the rest of the rock, indicating that the etchings were made after the rock had obtained some of the outer varnish. However, the fact that some varnish exists in the etchings themselves indicates that the etchings were not made recently. This varnish takes time to build up. To understand this, imagine a rock in a river bed. If you throw a rock in a river bed today, over time it will develop a type of sheen that comes from the motion of the water and the organic materials that adhere to the rock. It will take years for such a varnish to develop. If you take the rock out a week after you throw it in, there will be no noticeable varnish or sheen to it. 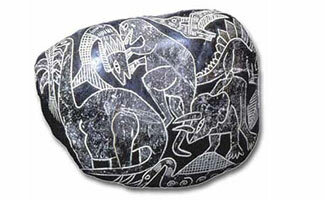 The fascination with the Ica stones is due to the etchings on the stones. They give us a glimpse into what human life may have been like during prehistoric times. They offer new evidence of dinosaurs and human life in the prehistoric era. But, the images that are etched on the Ica stones aren’t the only pieces of valuable information that the Ica stones offer. Like the pyramids, the Ica stones require tools that would seem to be unavailable during prehistoric times. Today, tools that would make etching into andesite are readily available. Until the Ica stones were found, it was assumed that intricate tools such as the ones required to etch the images into the Ica stones were not available to those that may have lived during prehistoric times. In a time when it is assumed that things like the wheel did not even exist, how could such a tool be made that would make it possible to etch intricate lines and patterns into such a hard canvas as the Ica stones? This is a question that plagues scientists and makes them question the validity of the Ica stones. Most scientific findings having to do with the existence of man prior to the last few centuries would indicate that mankind was busy simply trying to exist. The idea of man living during the times of dinosaurs brings to mind groups of huddled masses trying to avoid being lunch for large reptiles. The Ica stones give us a different view of prehistoric man. Was mankind advanced enough to require entertainment? Are the Ica stones some form of educational tool that was created for use as visual aids for a child’s education? Are the Ica stones the first version of man’s history book? In short, what was the purpose of the Ica stones? History teaches us that written communication in the past was in a very limited form. For instance, Cherokee Indians did not write letters to each other until the Europeans became involved in their lives. However, they did use wampum belts to send messages in a nonverbal manner across great distances. Were the Ica stones used in a similar manner or were they simply a hobby of prehistoric man? Given the primitive tools that scientists believe to be available during these times as well as the actual images depicted on some of the stones, the question of alien involvement has come to surface. Some of the etchings involve astrological images that indicate advanced knowledge of the solar system, including the geography of the world at the time. Medical procedures depicted on the stones also indicate a level of knowledge that surpasses what scientists believe to be available during prehistoric times. Some of the stones even depict aliens or astronauts themselves. For some, the question of alien involvement in the Ica stones is not a question at all, but a belief that is based on lack of evidence to the contrary. For others, more evidence is needed to pierce the skepticism that makes the scientific community what it is. Every aspect of the existence of the Ica stones lends scientists reason to ask more questions about what they think they know about the history of man. From the existence of aliens, to the social schema of prehistoric times and the thought processes of mankind during prehistoric times, everything that scientists know is put to question when the concept and detail of the Ica stones is considered. Were aliens involved in the history of mankind? Did mankind have a higher level of cognitive intelligence than was originally thought? Do the Ica stones indicate the use of educational tools, tools made to record history, or perhaps a message to future generations? Or, were the Ica stones the carvings of an artist with an elaborate imagination that happened to be able to reproduce precise geographical locations as well as medical procedures? The Ica stones even lead us to question the relationship between humans and dinosaurs. While some of the etchings on the Ica stones depict man running to safety from dinosaurs, others show what may be dinosaurs and humans working together to meet goals that pertain to survival. In truth, more research is needed before any solid conclusions can be drawn, but the Ica stones certainly have shed new light on modern day man’s concept of life during prehistoric times. Hello. I have been fascinated by “rocks” since I was a child. At 50 years old, I discovered these rocks held secrets under the fossilized dirt. I have several Ica stones, mostly smaller. I also have stones that have taken me years to carefully clean. Experts here have not acknowledged these finds. The most incredible finds that I have discovered, are at what is now sea level, in the lowest sedimentary layer, 4 feet above sea level, in the eroding cliffs. I have carefully collected some specimens, dried them, and preserved them to the best of my knowledge. Upon calling the experts to ask how old that particular sedimentary layer was in that particular location, I was told “about 5 million years old”. It was after that I mentioned what I had found. No-one returned my calls, nor showed interest in the hand carved stones that I have preserved from this layer. I am not out to make a name for myself, I feel it extremely important that history, as it reveals itself, is acknowledged, and respected. Which is why I would like to ask for your assistance. I am not a professional, however my passion for these relics has me with quite a collection that should be documented by someone of authority to honor the past elders who walked before us. Please comment below should anyone find this of interest. If these artifacts show proof of advanced medical technique and even the possible knowledge of flight…..why are they chiseling Rocks? Not to mention the language is pictography….the most rudimentary of written communication.